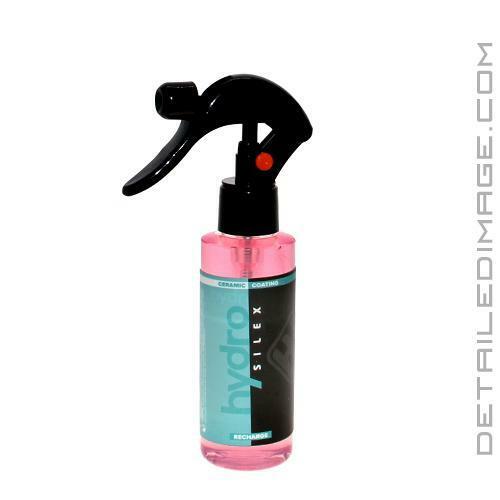 The HydroSilex Recharge is an Sio2 based, easy to apply, spray on protection product! In short you can mist it on clean paint, wipe away any excess product and get durable protection that looks great! The unique chemical makeup of water-based Silica Dioxide makes this formula a pioneer in detailing. Once cured, Recharge morphs from liquid to a highly flexible transparent top layer, that adds gloss, and protects various surfaces from the elements. Use Recharge on boats, planes, cars, trucks, showers, kitchens, motorcycles, bicycles, lawnmowers, glass, plastic, metals, fiberglass, vinyl, paint protection film, wheels, wood, Plastic-Dip, stone, countertops, single stage paints, gel coats, clear coat finishes and so much more. To apply, HydroSilex recommends three application types, Dry Surface, Foam Cannon, or a Wet Application. Take a look at the in-depth application instructions below. Once applied, you will be wowed by the hydrophobic effect, extreme gloss, UV protection, slick surface and self-cleaning effect. Under premium circumstances, such as surface type, environment, usage, condition, and cleaning, Recharge can last up to 6 months. If you are looking for an easy to apply stand-alone protection or coating topper, the HydroSilex Recharge is a great choice! Spray Hydrosilex Recharge onto clean vehicle surfaces. A light mist is all that is required! Follow up immediately and dry with a clean microfiber towel. No dwell time is necessary. Spray Hydrosilex Recharge onto all wet exterior surfaces. Apply a light application per panel or section. Do not allow Recharge to dry on the surface. A typical application will take about 2 to 3 ounces of Recharge. Rinse treated surfaces immediately before Recharge dries on the surface until water runs clear. Dry vehicle properly with a microfiber towel. Once the wash final rinse process is complete, fill the foam cannon dispenser bottle with Hydrosilex Recharge. Apply to Hydrosilex Recharge utilizing the foam cannon on all exterior surfaces of the vehicle. use approximately 250 ml per vehicle. Dry vehicle properly with a clean microfiber towel. Hydrosilex Recharge is a ceramic surface coating developed specifically to enhance the visual effect of a surface and to reduce maintenance. Hydrosilex Recharge creates an extremely slick and glossy surface highly repellant to any environmental contaminants with less maintenance required as a result. Hydrosilex Recharge can be applied to bare metal, stainless steel, aluminum, glass, plastic, fiberglass, stone, marble tiles, and more. Smooth dry surface: Spray a fine even mist on the clean surface. Immediately dry with a clean microfiber towel. Buff gently using an additional clean microfiber towel until all residue is gone. Rough surface: Spray a fine even mist on the surface. Let it air dry. Interior surface: Spray a fine even mist on the surface. Buff gently using a clean microfiber towel until all residue is gone. It's a great product that I use in my arsenal of quick finishing coatings.